It is possible to add documents which are saved in pdf format to the website. These could be letters, telegrams and other original documents which you might have scanned, an autobiography, or a write-up of a research project you may have carried out. To add a document, click the ‘add entry’ button and then select ‘media’. Click the ‘upload’ button and then use the ‘browse’ button to select the document from a folder on your computer and click ‘open’. It may take a few minutes for larger documents to be uploaded to the website so please be patient. If the document is part of a collection, or you want to upload several files and keep them together as a collection, then write a collection name in the box provided. In the caption box, give a brief description of the document. If you upload a pdf with more than one page, only the first page will be shown on the website preview, so make sure to include information on what the rest of the document contains. 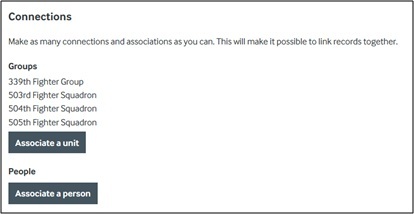 Next, link your document to as many different records on the website as possible using the ‘associate’ buttons in the ‘connections’ section. Try to link the document to the pages of the people, places and aircraft which are mentioned within the document. If you can’t find the records you are looking for, it may that they haven’t yet been created on the website. You can create new records yourself, using the ‘add entry’ button. It is best to do this in a separate tab or window, as leaving the page of the document before you click ‘save’ could mean that you lose all of the information you have added.